THE planned expansion of the Vision City Mega Mall is being considered on the back of business needs and the economic climate next year, Mega Mall general manager Anderson Ting says. 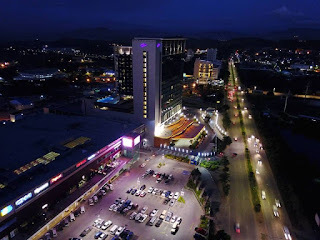 “The expansion of phase three can either be towards the Food Court or start from Star office – depending on the projection of 2018 and 2019 business needs and promising economic conditions,” he said. He said the RH group had invested a lot in the country “and we will continue to do so on top of setting the benchmark in the retail industry”. He declined to disclose the plans further but said “be assured it will be something exciting for all Papua New Guineans”. He said about 9000 people go into Vision City on weekdays with the highest on record for the year being 18,000 in a single day. He was commenting on the preparation for the festive period being done two months in advance. “On the lowest period during weekdays, we clocked a minimum of 8000 footfalls. And the highest registered at 18,000 traffic coming into the mall,” he said. On a daily basis, you can expect around 9000. This can tell you what the potential yield of a business return is in Vision City. “Preparations for Christmas and New Year was done two months in advance. “Needless to say, we have increased drastically the manpower, especially on security aspect in ensuring adequate coverage round the clock.